New Star Brazilian loose curl bundles with frontal. We use genuine human hair on those bundles and lace frontals, I mean 100% Brazilian human virgin hair. To keep the original state of the hair, we do not use any chemicals to process, so the original shine and softness of virgin hair are kept, and this will make bundles and frontals very close to your natural hair texture. 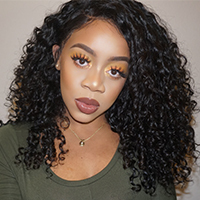 About our bundles with frontal combination, we have a lot of options in length, according to your existing hair, please choose the most suitable length option so that your hair will look fuller and more natural. After wearing our bundles with frontal, you will realize that it is a wiser choice to wear hair weaves and frontal together than only wearing bundles. Now on New Star Hair Official site, there are new arrival bundles with closure or frontal, purchasing these hair products together will save your budget. Looove it as usual! It came within 2 freaking days! The hair is flawless as always the seller communicated the entire time I’m really happy it arrived just on time for me to do my hair for an event I have this Saturday I can always count on you guys!